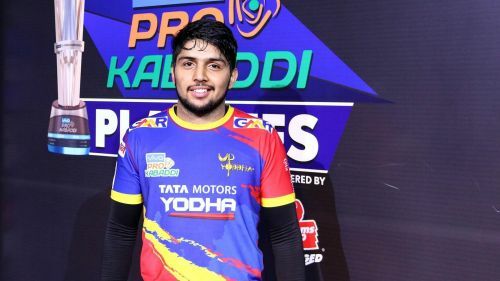 UP Yoddha were one of the four franchises who joined the VIVO Pro Kabaddi League in the league’s fifth edition. Two years later, the Lucknow-based franchise is the second most successful of the four teams that transformed the eight-team tourney into a 12-team one. They have qualified for the second stage in both the seasons they have played but unfortunately they have never made it to the final. In the first season, the Yoddhas performed dominantly in the league stage and had an easier path to the play-offs compared to their second season where they scripted one of the most epic comebacks of all time. They were in the bottom-half of the points table for a major part of the season yet they made it to the play-offs thanks to some miraculous performances from their players. This year the Yoddhas would look to cross the final hurdle and try to win the title. They have made a lot of changes in their team this year. You can check out their full squad here. The most important thing for the franchise this year will be the decision to crown their leader. Here are the 3 players who can lead the Uttar Pradesh team in the 7th season Pro Kabaddi League. Nitesh Kumar stunned everyone with his remarkable performances in the defense department of UP Yoddha. In the previous season, he became the first ever defender to reach the 100 defense points mark in a single edition. Given he has a good understanding of the game and now even has the experience of playing in pressure situations, the owners might want to name Nitesh as their skipper for the upcoming season. There is no other defender so experienced as Kumar in the UP squad. Hence, he is the prime contender from the UP defense department to get his team’s reins.